_The name of Noank, a village of Groton, comes from the Mohegan Indian word for "point." _Noank was a busy port in the nineteenth century. To help mariners enter the Mystic River and the harbor of Noank, Connecticut, from Fisher's Island Sound, the federal government decided to build a lighthouse at Morgan Point in 1831. Land for the light station was purchased from shipbuilder Roswell Avery Morgan, a descendant of an early settler of the area, Deacon James Morgan. The first lighthouse was a 25-foot white granite tower with a separate six-room stone keeper's house. The tower held 10 lamps and reflectors. The first keeper, Ezra Daboll, made some additions to the house and was reimbursed for his expenses of $100. Daboll died in 1838 and was succeeded by his widow, Eliza, who remained keeper until 1854. Lieut. George M. Bache reported in 1838 that "the establishment is kept in great neatness by the widow of the former keeper." Eliza Daboll had six children, and her eldest daughter took great interest in maintaining the light. The girl became known for her habit of singing loudly while working at the lighthouse in foul weather. There were complaints that Morgan Point's Light was too dim; the nearby lights at New London and Stonington could be seen from far greater distances. The situation was improved somewhat in 1855 when a sixth-order Fresnel lens replaced the old array of lamps and reflectors. _Captain Silas Spicer, who became keeper in the 1850s, saw a burning vessel offshore one day. _ He quickly rowed to the ship and rescued the captain, his wife and child, bringing them safely back to the lighthouse. The grateful family spent a few days recuperating at the lighthouse. The shipbuilding industry was growing in Noank by the 1860s. It was decided that a new lighthouse was needed, and construction began in 1867. 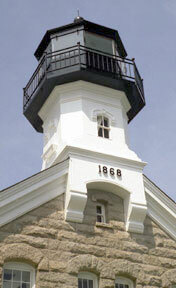 The new lighthouse, finished in 1868, was a two-story, eight-room granite structure with a cast-iron light tower attached to the front of the roof. The building's style was very similar to others built in the same period at Sheffield Island, Block Island, Great Captain Island and a few other locations. The lighthouse was built under the supervision of a local man named Henry Davis, who later became the U.S. Assistant Superintendent of Lifesaving Stations. Morgan Point Light had a second female keeper in Frances McDonald, who took over for her husband Alexander, a Civil War veteran. Frances McDonald kept the light from 1869 to 1871. She was replaced by her brother, Mystic native Thaddeus Pecor, a Civil War veteran who served 48 years at the station. There are rumors that the ghost of Keeper Pecor still frequents the lighthouse. One winter during Pecor's tenure, the survivors of a wreck rowed to Morgan Point. The keeper had to cut the frozen clothing and shoes from some of the frostbitten sailors. _In 1921, the lighthouse was discontinued and replaced by an automatic light to the east on Crooks Ledge. The lighthouse was sold to a private party for $8,625. According to some sources, the original lantern was destroyed in the hurricane of September 1938; others say it was removed in the 1920s. 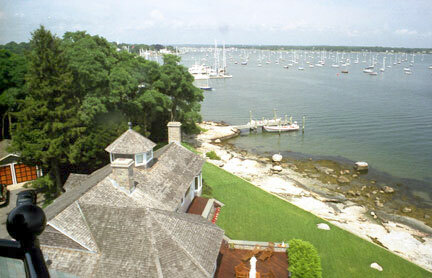 Left: The light at Crooks Ledge, listed as "Noank Light 5"
_In 1991, the property was purchased by Jason Pilalas from San Marino, California, a partner in an investment management firm. _ Right: Circa 1960s, during the lighthouse's "headless" days. Pilalas grew up in Greenwich, Connecticut, near the Great Captain Island Lighthouse that is almost identical to the one at Morgan Point. He set out to restore the exterior of the lighthouse to its original appearance, while converting the interior to a comfortable living space for his family. Herman Hassinger Architects of Moorestown, New Jersey, was commissioned to do the renovation. _The interior was gutted to the granite walls. The rooms were designed to create a more spacious feel and more interior light. The first floor of the lighthouse became a living space and library, while the upstairs was converted to bedrooms. A new lantern room was fashioned of aluminum and glass from U.S. Lighthouse Service designs, at a cost of $35,000. An extension including a master bedroom and office was added at the back of the lighthouse. The Pilalas family summers at Morgan Point. Jason Pilalas has said, "I couldn't be happier. I get so excited every time I come here." 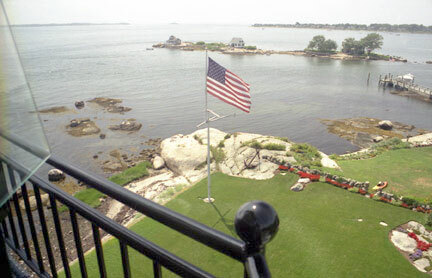 _The lighthouse is the setting for an annual family Fourth of July party. Rena Pilalas, Jason's wife, told Coastal Living magazine, "They sleep on couches, they sleep on the floor. They don't care -- they just like being here." The grounds of Morgan Point Lighthouse are closed to the public, and the lighthouse is difficult to see from any point on the shore. _Jason Pilalas occasionally fires a 10-gauge cannon to entertain tour boat passengers. Above and below, views from the top. The lighthouse can be viewed from various excursion boats in the area. The Noank Historical Society Museum houses materials relating to the history of Morgan Point Light. The museum is open in the summer.